Selling stock photos has been going well this year. However, while most photos for my website make it to the stock sites with logos and trademarks removed, the reverse isn’t true as many stock photos don’t make it to BillChizekPhotography.com. These can range from the texture of a wall, grass with morning dew, or a piece of wood; subjects that allow copy space for advertisers to insert text, nothing appealing for a photography website. That said, I try to post a variety of photos about five days a week to my website and all the stock photos taken that week. Posting one photo daily ensures website traffic, if I posted thirty photos most visitors would just look at them one time and move on. Posting as many stock photos weekly as possible is important because they don’t make money sitting on a hard drive. However, this year I decided to post nothing but patriotic stock photos for the long Fourth of July weekend. For this, I used stock photos of flags flying in the yards near where we live in Coronado, California. 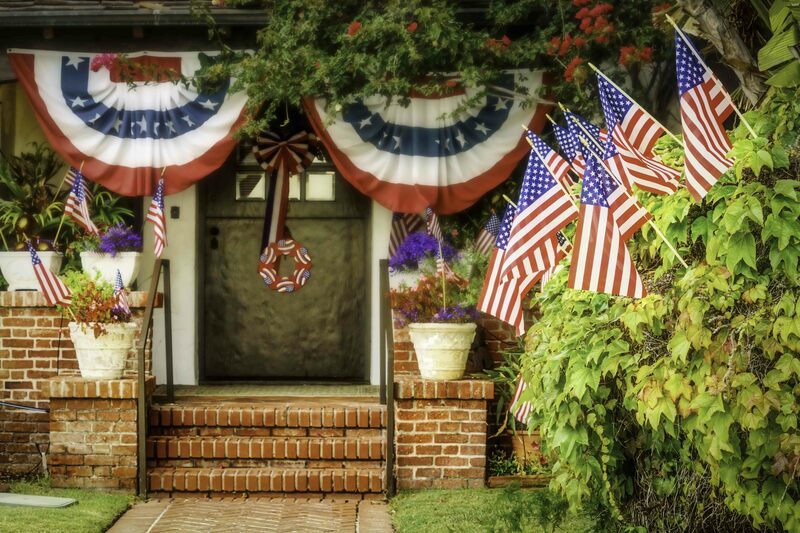 Not surprising to anyone living in Coronado, but many homes here fly the flag year round. In fact, only the photo at the top of this post was taken on the actual Fourth of July weekend (click HERE for original photo). Yes, you’d be hard pressed to find a more patriotic community west of the Mississippi! This is largely due Coronado having a unique military history, a good portion of Coronado’s land is occupied by Naval Air Station North Island. Almost since the beginning of Naval Aviation, many Naval Aviators have relocated to Coronado at various points in their careers. Many homes proudly display blue yard signs reading “Home of a Naval Aviator” and these are everywhere. To say this little town is kind of proud of the US Navy is like saying that little town back in Wisconsin is kind of proud of their Packers. That’s why most of these photos were shot months ago in anticipation that advertisers would be looking for patriotic photos for their Independence Day deadlines. Coronado was the perfect location for this because with flags flying year round, my patriotic stock photo search was mostly complete last May. This photo to the left may look like it’s been set up for an upcoming holiday, but this street looks like this practically for 365 days of the year! Yes, even with the white picket fences. Coronado is home to many active duty and retired military, plus it’s the home of the US Navy SEAL’s who train here. Since 2007, Coronado has been home to our family for about seven years. It’s where I, like many others, retired from the military. It’s probably because Coronado is just one of those places that’s comfortable to military people because being retired military here isn’t a novelty. This is probably another the reason that flags fly year round here. Shooting stock photography here couldn’t have been easier, if I liked a particular photo but felt it was missing something, I didn’t have to spend hours in Photoshop doctoring the pic to get it right nor did I need to seek new locations. All that was needed was to return to the same location at a different time of day! The differences between morning and evening lighting, seasons, and weather all ensured a variety of photo settings. The photo location for this shot at left didn’t work the few times I tried, it was always lacking something. However, returning one morning and catching the sun behind the flag seemed to make it click. As a photographer, that’s one of the nice things about living somewhere that others travel to for vacation, if you don’t get a photo the way you want it you can just return later. While I’ve loved living here, my wife a service member and it’s our time to roll to the next place to call home for a while. Fortunately we’re moving to another incredible place that should prove interesting not only for photography but for our family as well, Virginia. As a former adjunct history professor and lifelong history buff/nerd/geek, I can’t think of another place I’d rather be located other than at my own house in Texas. Coronado has been a great place to raise our daughters, who have loved the beaches and learning to swim at the rec center, leaving friends and Coronado will be tough. While moving an entire house every three years or so can be draining, once settled at the new location this nomadic lifestyle can be rewarding. Since taking up photography, military transfers seem to recharge the creative batteries. In Coronado, even the below photo of springtime and blooming flowers came out patriotic, ya… it’s just that kind of place. Prev Post: Digital Exposition in Madrid!